Anyway, the not-so-pretty dish above was a spin-off of a tasty treat that my mother-in-law made during our visit to Japan. It was simply enoki mushrooms (the really, really skinny ones) dressed with smashed umeboshi (pickled plums). I didn’t have enoki, so I chopped white button mushrooms and sautéed them with finely chopped white onions. When it came to the umeboshi, I didn’t know how many to smash. I started with two, and it seemed like such a tiny amount. So I added two more. Please note that these were larger than average umeboshi that we brought all the way from Japan. They are exceedingly tasty. So then I added the umeboshi paste to the mushrooms and onions with a few drips of soy sauce. But once I started mixing it all, it became clear that four umeboshi was WAY too much. The dish was much tangier than anticipated, to put it mildly. But it was edible over rice or tucked inside onigiri. The second dish for this dinner was konnyaku, prepared according to a recipe on Just Hungry. I let it cook until all the liquid was absorbed or evaporated and then arranged the konnyaku in bowls and topped it with chopped raw green onions. It wasn’t bad, but it was much saltier than I would’ve liked. I could have cut the liquids by half, I think. Perhaps the original recipe was for more konnyaku. The meal was rounded out with tofu (with onions and soy sauce), rice, and miso soup with napa and onions. In other words, it was very, very salty and oniony. I had a dream about konnyaku last night, so I thought it must be time to write up this super-duper stir fry. We’ve been finding lots of fresh crunchy green beans in the stores lately, and Yusuke thought they would pair well with konnyaku. First he boiled the beans and konnyaku with a pinch of dashi in the water. Then he sautéed the konnyaku to reduce the water it contains. Next came the beans and the spice: sesame seeds, soy sauce, mirin, dashi, red pepper flakes, and sesame oil. 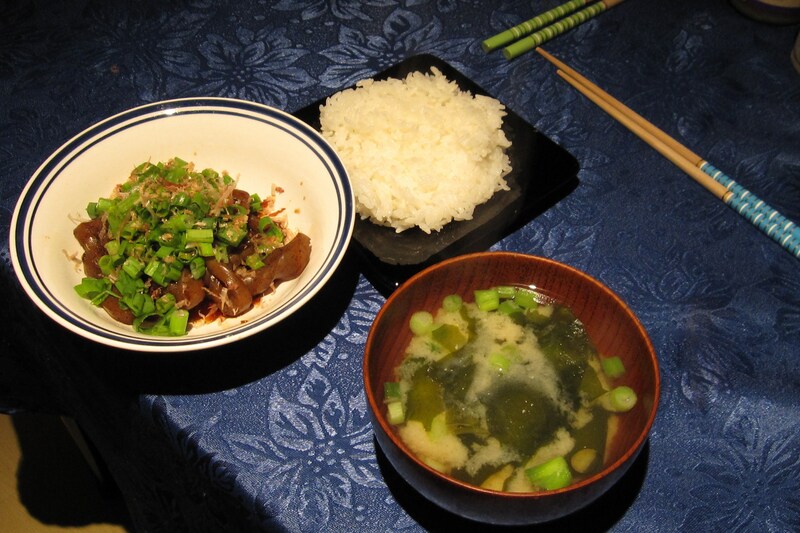 On the side, we went with more moderate tastes with rice and miso soup with daikon. We finally got around to visiting the famous Atwater market in Montreal. We didn’t go during the peak time on Saturdays, but there was still a nice selection of wares to peruse. After much debate in front of this fruit and vegetable stand, we selected fresh, crunchy green beans. Yusuke combined the beans with thin strips of konnyaku and carrots, all boiled in a sauce of soy sauce, mirin, dashi, and perhaps some other stuff (he can’t remember). The konnyaku really soaked up the sauce, so the saltiness nicely matched the beans’ crunchiness. The last vestiges of winter are slowly creeping away (at least they better be), so I thought I should write up these lovely stews while they still seem seasonally appropriate. Our December trip to Japan gave us the opportunity to have several special dishes that are especially associated with wintertime. In mountain town of Gora, we had a fabulous lunch in a noodle restaurant. I chose soba—thin buckwheat noodles—and Yusuke selected udon, which is thick, almost doughy noodles. Both dishes had a light broth, probably soy sauce-based. My soba featured delicious mountain vegetables, like mushrooms (yay! ), bamboo shoots, fiddleheads, and onions. My mother-in-law made this soup one evening during our visit. Root vegetables are especially popular during the winter, and so daikon is the main element, along with pork, shitake mushrooms, and mizuna, a flavourful leafy green. Daikon is a root veggie, but since it’s a radish, it’s not starchy like potato or squash. The texture is much smoother and juicer, especially when it’s nicely ripe. If it’s not good quality (like we sometimes get in Montreal), it’s rather stringy. In Japan, all of the daikon was huge, white, and smooth, and it melts in your mouth when cooked in a stew. In Montreal, in contrast, sometimes it’s small and skinny, greenish, and pock-marked. Boo. I miss daikon in Japan. Oden is awesome. It’s a pot dish that typically has various soy-based and processed fish-based products that are completely foreign to Western cuisine. The wikipedia article has a more detailed explanation. My mother-in-law made quite the oden feast. One of my sisters-in-law and I monopolized the konnyaku, but I liked all of the new things I tried in this dish. Another of my favourites was the kombu, which is thick seaweed, neatly tied into bows here. There’s also hanpen (the white triangles of surimi aka fish purée), gobomaki (boiled greater burdock root wrapped in surimi), chikuwa (tubes of surimi), ganmodoki (fried balls of tofu mixed with grated vegetables), and atsuage (deep fried tofu). When I was writing up my last post about konnyaku, I got hungry for it again, so I chose it for this meal. Yusuke and I tagged-team to prepare Just Hungry’s recipe for Konnyaku no Tosani. Yusuke even figured out how to make the cool twisty konnyaku strips. Basically, we just boiled the konnyaku, changed the water, and then boiled it with more water and dashi, soy sauce, mirin, sake, and ginger. We ate it topped with more ginger, sesame seeds, green onions, and bonito flakes. Our accompanying soup was miso with wakame and tofu. Yusuke also decided he needed fried eggs to slake his hunger after kendo practice. This post also marks a new era of better food photos. We had planned to buy a new digital camera in Japan, but the loonie is absolutely wretched against the yen at the moment, so it was less expensive to just buy one here (Yusuke managed to find something suitable amidst the stone age technology of North America). I still have lots of old pictures kicking around that I might use, but the photography will, I hope, improve. I was introduced to a new, erm, substance in this stir fry. I had read about konnyaku on the Just Hungry blog, and I asked Yusuke if we could try it. Konnyaku is a gelatin-ish food made from the konjac (a.k.a. konnyaku) plant. The package that we bought calls it “yam cake,” but apparently it has no relation to yams or potatoes of any sort. Konnyaku is described as a miracle health food, since it is very filling, has almost no calories, and has tons of fibre. The texture is the main appeal for me, and it’s impossible to describe to someone who hasn’t eaten it. It’s not as chewy as a jelly bean, but it’s much firmer than silken tofu, and it’s not dry and crumbly like firm tofu. Like tofu, it soaks up and compliments any flavours that are combined with it. 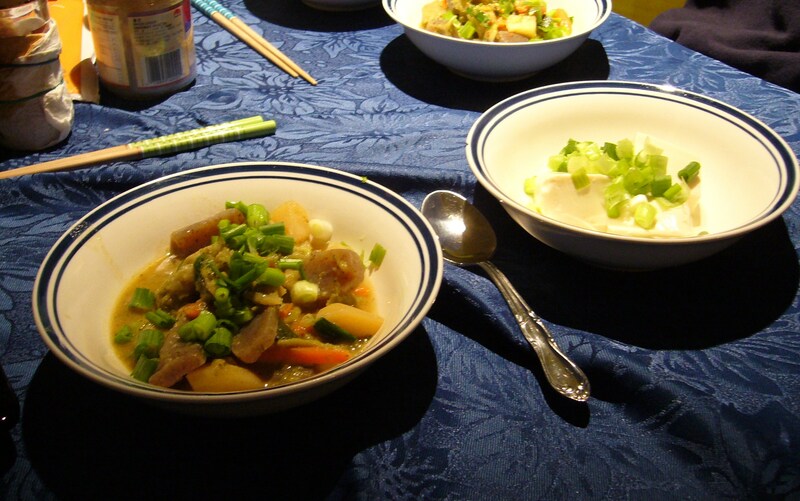 In addition to the konnyaku, the stir fry includes potatoes, carrots, and green onions. Yusuke used his standard stir fry ingredients, namely ginger, garlic, and soy sauce (and maybe salt, mirin, sugar?). 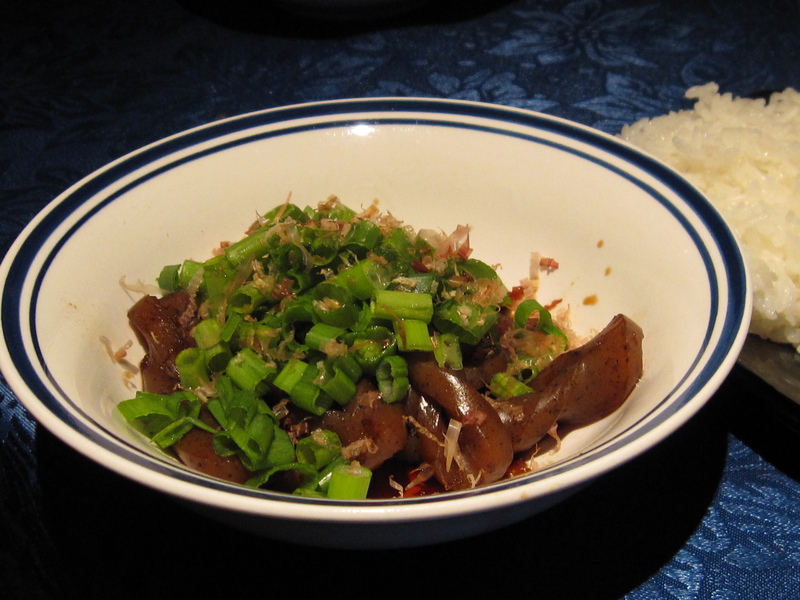 Our side dish was yudofu topped with green onions, ginger, soy sauce, and bonito flakes. Apparently one of the concerns over konjac as a jelly snack is that it can be choking hazard and is actually banned in North America. I also read a caution that swallowing it without chewing it properly has unpleasant consequences for some people. A note on sources: I read the wikipedia article on konjac as well as the informative konnyaku posts on Just Hungry. Of course the Internets provide many other additions to konnyaku wisdom. For example, I particularly enjoyed this site’s pronouncement: “Konnyaku is one of the most effective items for defending yourself from fatness.” And another: “Konnyaku surely helps your physical and mental health.” Sounds good to me!